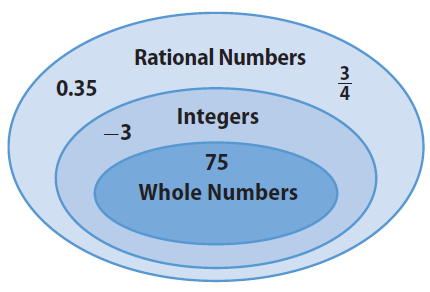 Students who are studying math in primary level must be aware of classification of rational numbers. We can use Venn diagram to classify rational numbers. A Venn diagram is a visual representation used to show the relationships between groups. 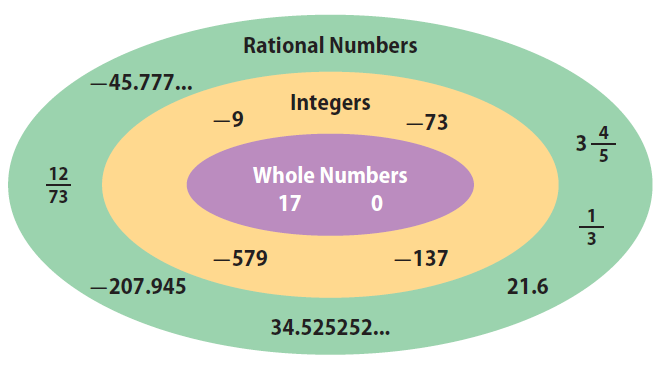 The Venn diagram below shows how rational numbers, integers, and whole numbers are related. The following are the classifications of rational numbers. Non terminating recurring decimal is a rational number. But, non terminating non recurring decimal is not a rational number and it is irrational number. Place the following numbers in the Venn diagram. Then classify each number by indicating in which set or sets each number belongs. The number 75 belongs in the sets of whole numbers, integers, and rational numbers. The number -3 belongs in the sets of integers and rational numbers. The number -3/4 belongs in the set of rational numbers. The number 0.35 belongs in the set of rational numbers. Classify the following two numbers as rational and irrational and also explain your answer. Even though 5.312312312.......... is a non terminating decimal, there is a repeated pattern 312 in it. So, 5.312312312....... is non terminating recurring decimal. Hence, 5.312312312....... is a rational number. 5.385164807............ is a non terminating decimal and also there is no repeated pattern in it. So, 5.385164807............ is non terminating non recurring decimal. Hence, 5.385164807............ is an irrational number. considered to be a rational number ? Explain. Rational number is usually expressed in the form a/b. So, if we can express any number in the form "a/b", the number can be considered as rational number. 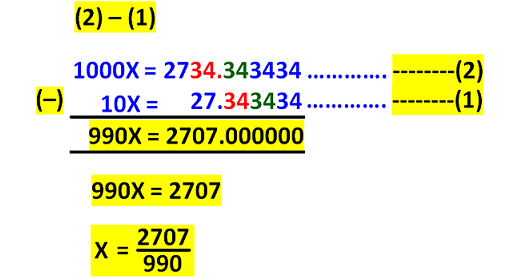 Now, let us see, how to express the number 2.0343434...... in the form a/b, say fraction. Identify the first repeated pattern and second repeated pattern as as explained below. Now we got the fraction which is equal to the given decimal. Since the given non terminating recurring decimal can be written as a fraction, it is considered to be a rational number. After having gone through the stuff given above, we hope that the students would have understood "Classifying rational numbers". Apart from "Classifying rational numbers", if you need any other stuff in math, please use our google custom search here.